This is a 3-minute excerpt from the BBC national TV programme Newsnight. Reporter Mark Mardell visits a small private boys' school, St James, previously in central London but by this time moved to Twickenham, on London's south-west edge. 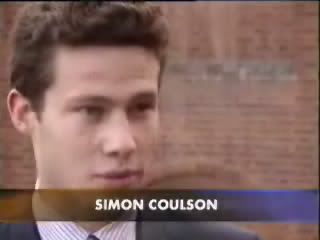 This report was broadcast on 29 October 1996. Corporal punishment in private schools was then still legal, but in practice being used by very few schools. St James briefly became famous for being one of the very last holdouts. It was a time when poor discipline in schools was at the top of the UK political agenda. CP had been abolished in state schools ten years previously. Prime Minister John Major was opposed to reintroduction, but it became clear that his Conservative Party was deeply split, with some Cabinet Ministers, even including his Education Secretary, making it clear that they were personally in favour of bringing back the cane. They were strongly supported by many Conservatives outside Parliament and notably by the Daily Telegraph, the UK's biggest serious newspaper. This affair culminated, in January 1997, in a backbench Tory move in Parliament to reintroduce CP. Although the pro-CP dissidents failed in their attempt, 101 MPs voted in favour. "Caring headteacher who believes beating can be good for his boys" in The Independent. Shortly afterwards, in the May 1997 elections, the Conservative government fell from power. The incoming Labour government, so far from restoring CP to state schools, promptly abolished it in private schools too. In the film, headmaster Nicholas Debenham explains why he still uses the cane, and three senior boys, all of whom have themselves been caned, say that it is a deterrent which they support. They think it could and should be restored to state schools -- the subject of the then raging controversy. 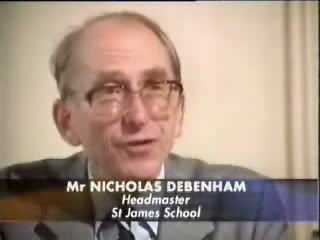 Not stated in the film, but mentioned in the Daily Telegraph piece referred to above, is that Mr Debenham claimed to be caning about six boys a year, with a maximum of five strokes on the seat. Parental consent for CP was required at the time of entry to the school. Neither this TV report, nor the two newspaper articles mentioned above, give any hint that St James was anything other than an ordinary private boys' school, whose only oddity was that it retained caning. In fact, St James is one of a group of schools set up by, and still owned by, an extremely weird cult, the misleadingly named School of Economic Science. This cranky outfit, complete with the teachings of obscure Indian mystics and the compulsory learning of Sanskrit, has more recently become the centre of many allegations of physical brutality and mental mistreatment stretching back decades and going far beyond mere corporal punishment. (In fairness, practically all of these complaints appear to relate to the 1970s and 1980s, not to the era of this TV report.) In the course of this it has been claimed by more than one recipient that headmaster Nicholas Debenham, who seems to have been high up in the inner counsels of the cult, caned boys on their bare bottoms as recently as the 1980s. I have no idea whether that was still his practice by the time this TV film was made. A private inquiry, described as independent, into these allegations has now published its report. Some of the complainants appear to regard it as a whitewash. It is impossible for an outsider to know who is right. The report says that Mr Debenham (who has now retired) claimed that only on one occasion was any caning not given over trousers. The report's author, a distinguished QC, does not seem entirely convinced by this assertion. 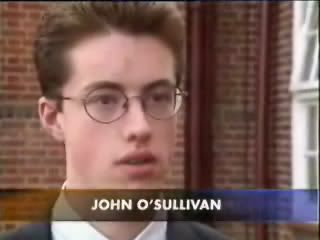 Strangely, the inquiry report states that the senior boys' school ceased entirely to use CP in 1996, despite the fact that the above-mentioned press items and this TV report appeared only at the end of October of that year and made it clear that the school was keen to continue caning. 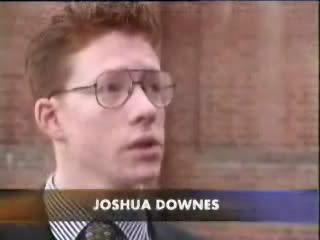 And indeed this BBC report from 18 months later in March 1998 says that only then had Mr Debenham "recently suspended the use of corporal punishment" pending clarification of the law. Was the inquiry report misinformed? At all events, with hindsight we can see that this short TV item is of historical interest in that it caught the very last gasp of English schoolboy caning. IMPORTANT: This video material is BBC copyright. This brief excerpt is reproduced under the "fair use" doctrine for private, non-profit, historical research and education purposes only. They must not be redistributed or republished in any commercial context.